To use or not to use strings? In rock, that’s a difficult decision to make. The dramatic intensity of a string section can be quite powerful, but overdone it can sound downright ridiculous. Done right — with the help of a sympathetic arranger — strings take a song to another level. Just think of the incorporation of strings by Buddy Holly (“True Love Ways”), The Beatles (“Yesterday”), Elton John (“Madman Across the Water”) and even the Ramones (“Baby I Love You”). Sure, a good country fiddle solo can add a jolt of energy to a tune like “Dust in the Wind” and ”Hurricane” but there’s more in more so for the moment, let’s focus our attention on full-on string sections in rock songs. While that song was hardly typical fare at the time, it was soon to become more commonplace. By the 1960s, many iconic hits were pulling in full-on string sections. In 1962, a string interlude added to the romantic mystique of The Shirelles, “WIll You Still Love Me Tomorrow?” or The Paris Sisters’ “I Know How You Love Me.” Undoubtedly, strings periodically played a role in Phil Spector’s Wall of Sound which you can hear manifest on tracks like “Uptown” and “Be My Baby,” thereby underscoring the impassioned vocals of The Crystals and The Ronettes, respectively. For Spector, strings were always there for the taking. As late as 1980, he was incorporating that kind of instrumentation in the Ramones’ version of “Baby I Love You” on End Of the Century. When the British Invasion commenced in 1964, guitars dominated since the music was intended to be performed by the actual band members on tour even if they had studio musicians filling in while creating the album. But one early British Invasion hit that bucked the trend was The Rolling Stones’ “As Tears Go By” (1965) which positioned its traditional string quartet against the Stones hard rockin’ ways. This approach likely influenced The Beatles on their own later hit, “Yesterday.” Indeed, both groups would experiment with more complex string arrangements within the next several years, especially The Beatles. Martin and Spector weren’t the only rock arrangers to repeatedly mine gold from the string section either. The legendary Paul Buckmaster literally began his career arranging the strings on David Bowie’s “Space Oddity” (1969). A classically-trained cellist, Buckmaster went on to work with the Rolling Stones on Sticky Fingers (1971) for which he did the arrangements for “Sway” and the album’s closing number “Moonlight Mile.” After that, he brought his magic to Elton John’s Madman Across the Water album, most notably on the title track and “Levon.” Before he died in 2017, Buckmaster had also brought his talents to projects of Miles Davis, Gun `N Roses, and Kelly Clarkson. Now that’s a wide array of artists. Two groups widely known for having strings as part of their DNA are the Moody Blues and the Electric Light Orchestra (ELO). Initially an R&B band known for “Go Now,” the Moody Blues experienced a radical identity shift when vocalist Denny Laine left and they reformed with guitarist Justin Hayward and bassist John Lodge joining drummer Graeme Edge and keyboardist Mike Pinder. In 1967, this newly envisioned group released Days of Future Passed with some symphonic backing from no less than the London Festival Orchestra. Over 30 years later in 2000, they were still at it with the live album Hall of Fame recorded with the World Festival Orchestra. Though their sound is hardly akin to the Moody Blues, ELO has also consistently used strings as part of their sound. Chart-toppers such as “Can’t Get It Out of My Head” from Eldorado and “Strange Magic” from Face the Music prominently feature strings — with an acknowledged debt to The Beatles. More recently, The Smashing Pumpkins distinguished themselves from other grunge bands via their effective use of strings on “Disarm” from Siamese Dreams and “Tonight, Tonight” from Mellon Collie and the Infinite Sadness thereby heightening the poetry in Billy Corgan’s enigmatic lyrics. 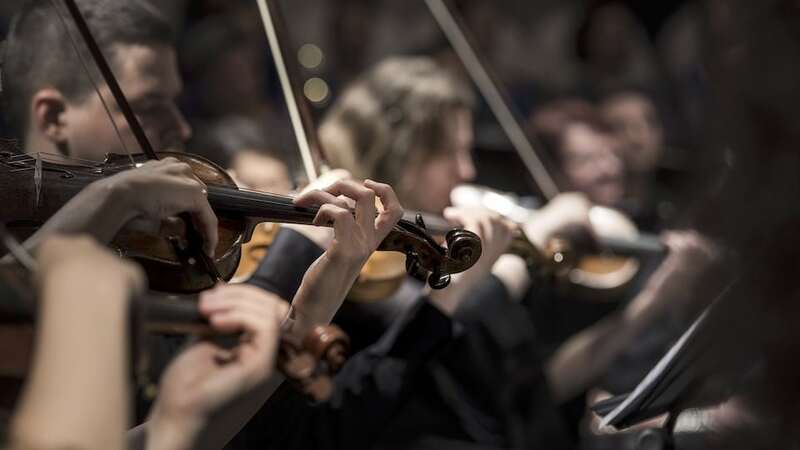 As to the London Philharmonic Orchestra’s recent trend of giving pop artists like Elvis Presley, Roy Orbison, and The Beach Boys the full orchestral treatment on tribute albums… Well, that’s a whole other article. Photo Credit: Image of string players courtesy of Pixabay. Another aspect of this is the vast number of pop, rock, and r’n’b songs and works that derive from famous classical melodies. I just saw your comment and that is a very interesting topic. Procol Harum’s “A Whiter Shade of Pale,” is one example. If I recall, it is based on a Bach melody. Love the Beatles? Get this eBook FREE when you subscribe. It turns out there's a lot to say. Just say "yes" to get yours.